A proof of concept is an example of a similar situation to the one you are theorizing, which shows that some element of that theory may be possible. It does not actually prove the theory. It does not really advance the theory itself. What it does is rebut, to varying degree, the opposition or complaint that your theory cannot be possible. To what level it then shows the plausibility of the theory is a matter of conjecture, not really quantifiable, and subject to many factors… some highly subjective. But a proof of concept is still very valuable, as it moves a theory into the realm of possibility. I have a list of various proofs of concept for my optical and New Atlantis theories, which address many complaints about that theory. But I recently came across a new, and very important example, which addresses several of the most common and widespread negatives, as voiced by those who do not think the theory likely, or even, possible. No one would make a book to look hundreds of years older than it was. Vellum was too expensive to use for all but the most important, and real, reasons. The skill and time it would take to make a large vellum book would mean it was done only by dedicated scribes. Blank vellum has always been very rare, and the later past it’s heyday, the rarer. And then I found the Chittenden book. Ironically, I was not even looking for it, I was looking at another book in the Lucius Chittenden collection in the University of Vermont. And that is the book from which I have excerpted the samples in this post. They do not appear anywhere else on the internet, nor, apparently, are they reproduced in any book. 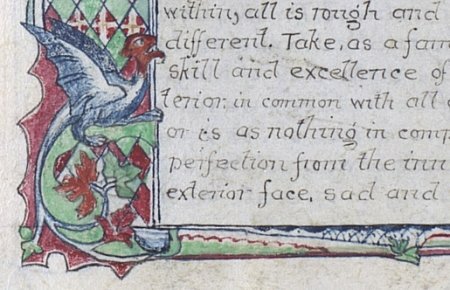 And then, I would like to point out, this example would not be a subject of any study, in any university, and would be unfamiliar to any expert who was consulted on the subject of “books on vellum made to look older than they were”. It is part of what I have been learning is a new discipline, pretty much undocumented, and which stands alone. I only suspected, when I began looking, that such a category of book must exist, although I have been, and still am told, that it would not, and cannot, exist: An illustrated, colored manuscript made as recreation/adaptation of an older work, on vellum, made to look much older than it is. So why did Chittenden make this work? I suppose we could easily deduce he loved the original, and wanted to produce his own copy. But he then took the time to translate it into English (it is a wonderful read, by the way, and ought to be published in it’s entirety). But while making this work, he chose to make it on vellum. He did so, I would again presume, to make it look old, like the original. And where did one find 100 sheets of unused vellum, in 1868? My previous research shows that blank vellum must have always been available, and I know it is, even today, so I am not too surprised at this. Perhaps he got it on one of his jaunts to Europe, or maybe he found an old stock in the United States. But there it is, he found it. And likewise, he found time to make it. This was a very busy man, by any standard. 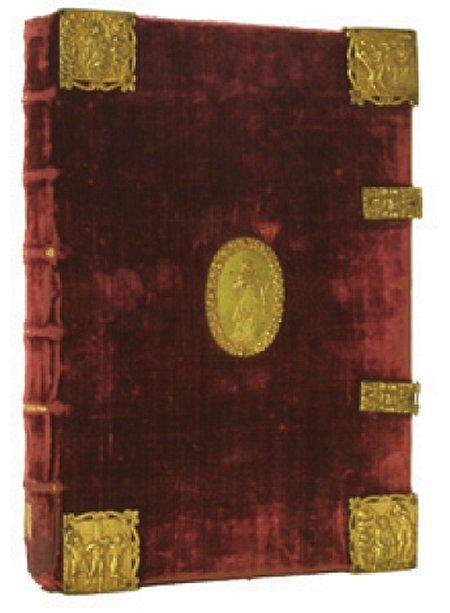 So rather than him needing to dedicate years or decades to producing it, he managed to serve Lincoln, the Treasury, his family, write several important histories about the civil war, slavery and politics in general… and, on the side, write and illustrate a 200 page copy of a 300 plus year old book, and on vellum at that. So what does this mean to my theories? Well it does not of course prove anything directly. But what it does is show that several of the concepts which are necessary to accept the possibility of the theory, were actually used, historically, by others. Of course this one example is from a later time than I suspect the Voynich was created, by 268 years. And we do not know when this vellum was made… although I would love to see a C14 dating of it… and so it does not support my contention that old vellum may have been used for the Voynich. But I have other examples that do that. What is most telling is that Chittenden wanted to make a book look 300 years older than it actually was, while I only suspect about 150 to 200 years for the Voynich. My other “proofs of concept” have been outlined in other posts on this blog: The Chymical Wedding is a fictional book made in my time frame, and in cipher, and meant to look like an older work; then there are my examples of blank vellum lying around, historically, ready for use, and even, used for centuries (reinforced, again, by this new example); the low cost of vellum, historically; the use of fake books as props and art forms, from the late 16th century, to today… and now I add the Chittenden book, which is a perfect, real example of a book lover finding enough blank vellum to letter and illustrate his own copy of a 300 year old book. No doubt there will be objections… of course I am quite aware of them, myself, in that I realize what this shows and what it does not. 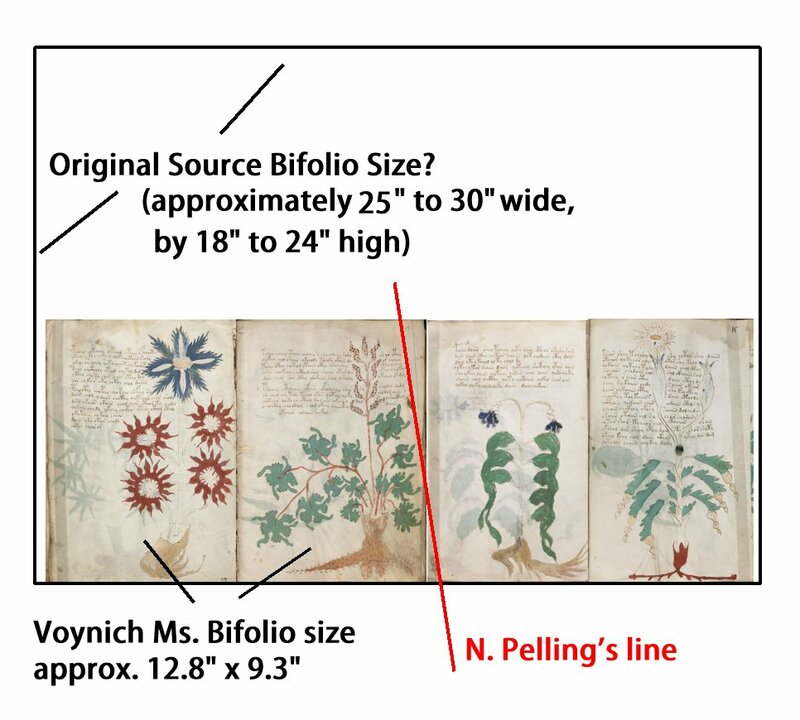 But at this point, for anyone to postulate that the Voynich “cannot be” made when and for what reasons I suspect it is, or even, that it is “unlikely” that this is so, really has the burden of proof from their perspective, not mine. 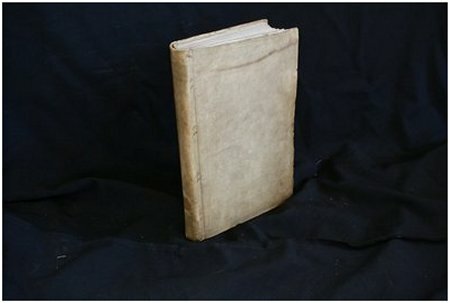 Old Blank Vellum Sitting Around? It has often been claimed, both before and after the release of the radiocarbon dating of the Voynich leaves, that it would have been either unlikely or impossible for the book’s creator to have found old vellum to make it from. This assumption has been used to presume the manuscript must have been made soon after the radiocarbon date of the vellum, which is approximately 1404-1438. It has been said that the cost of vellum and parchment throughout history has meant that it would not have ever been stored, blank, for long periods of time. And furthermore, the case of the palimpsest has been used to show that the value of vellum was so great that the religious scribes painstakingly bleached and scraped ancient manuscripts to reuse them. 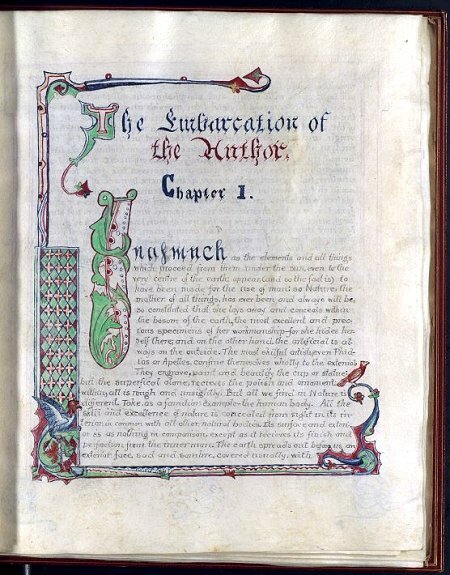 While all these may be true to some extent, during some times, in some places, what I have found is that it is not at all improbable that a Voynich author may have come across a batch of old, blank, vellum somewhere… and also, considering that some of the presumed intentions of said author, it would have actually been a choice more likely than one for your run of the mill herbal or astrological treatise. Back in 2007 I began looking for examples of blank vellum on the internet. I quickly found a book dealer named Pirages, who was advertising 20 or more sheets of what he described as, “RULED BUT OTHERWISE BLANK VELLUM MANUSCRIPT LEAVES”, which, he said, were from the 16th century. Apparently they were from some book, which was falling apart, because he believed they “were possibly from the previous entry”… a catalog entry which was gone by the time I saw the listing. Unfortunately, all 20+ leaves had also been sold by the time I contacted him, for $35 a piece. The point remains that in 2007, a person with a knowledge of historical ink formulas could have made a 40 page “Voynich Ms.” which would have radiocarbon dated to the 16th century. And, done so, for about $700. That is assuming that these leaves were too small to fold into quires, which would have then allowed an 80 page “Voynich”. Further searching revealed a book which was and is still on the market, the ” PROTONOTARII APOSTOLICII”, or Bullae et Statuta Officii Septem Sedis Apostolicae Protonotariorum In Curia Romana Participantium. It is offered by Michael Sharpe Rare & Antiquarian Books, for $95,000. This book is entirely in vellum, and was first created in 1523. It was then used for entries, continuously, until over 300 years later, the last entry being 1839. But it is not finished: The book remains for sale, today, with 44 blank leaves, comprising 88 blank pages, measuring about 11 1/4″ x 8 1/4″. So again, if you have the money, and the knowledge of historical inks, your summer hobby could be to make an 88 page Voynich rival… and when Arizona got it’s hands on a sliver or two, it would reliably date it to 1523. Well that would make a cute little Voynich, so write small! But at least it would make up for number in what it lacks in size, for you would have a full 302 page book when you were done. And there would be some head-scratching among manuscript scholars after Arizona got through with it (if you mixed your inks well, and not in brass containers, either), for it would apparently date to 1450 to 1500. In 2008 the British House of Lords had a decision to make. It seems they had some blank parchment left over, after making the decision to finally… after a millenia or more?… stop using it for official purposes. Below is the letter I found. Thank you for your e-mail of 24 July. It may be helpful if I clarified the position as far as Acts of Parliament are concerned. William Cowley Ltd. supplies vellum to our printer The Stationery Office. The costs include those for printing. The unused vellum held by the House administration will be used for the construction of the Roll of the Lords (and not Acts of Parliament). Members sign the Roll when they take the oath. have spoken to a colleague who deals with the Roll. He informs me that there are approximately 100 sheets. Given the limited use it is likely to take some time to exhaust this supply. It was probably not very old, I think we might assume. But it was blank, and it was in storage. Should we assume this same case did not exist in 1450, 1500, 1550, 1610, or 1912? Can we assume that for the first time in history, a government agency over-bought vellum, and was not sure what to do with the excess? Do we know that the author of the Voynich Ms. had no access to any such government stores? One is welcome to speculate these cases have always been impossible, up until 2008, but I cannot. I’ll take “some dozens” to be more than “two dozen”… but let’s be conservative and begin there. We know that in 1870 there existed (and probably does exist, today), 24 to 36 or more blank vellum leaves, equaling 48 to 72 or more blank vellum pages, which would carbon date to pre-1456. Not that I need to point this out, again, but with this little volume, whomever bought it, could make a nice little 210 page Voynich replica. And so on. Every so often, I search the internet for such examples. There are dozens more cases of between one and five or so, blank vellum or parchment leaves left blank, but this of course was standard practice to fill out the ends of books. I did not save those references. But examples such as the ones I list above, are easily found, today. There must be many more cases which I have not found, and which may have not made it onto online lists. The point is obvious, but I’ll summarize nonetheless: It is very possible that the Voynich could have been created at almost any date after 1438, from old, found, blank vellum. The fact that even today, ancient blank vellum leaves exist in quantity, reasonably implies it would have always been so. If a person desired to create an old-looking manuscript, at any time from the 15th century to today, they could have found a usable pile of old vellum, in the back of an old book, unused ledger, government archives, or a dusty old storeroom. 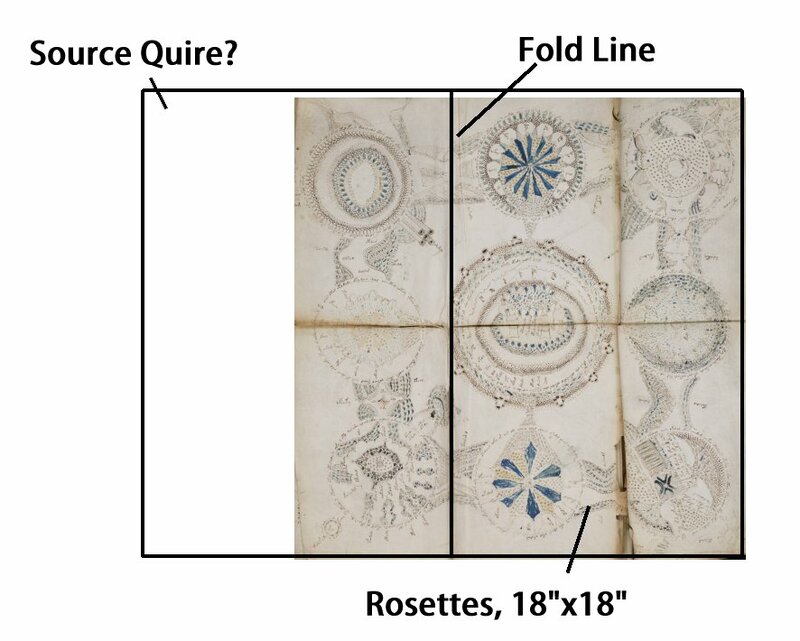 Adding to the proven existence of such vellum is the often assumed importance and value of the Voynich to the creator of it. 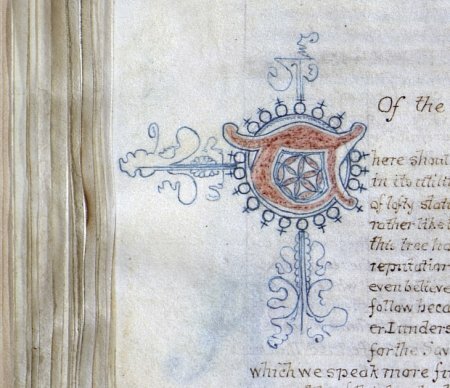 The vellum was out there, we know… and the Voynich author probably had every incentive to find it, and use it… whoever that was, and whenever they made it, from 1404 until 1912. I am, and have been, accepting of the radiocarbon dating results for the Voynich Manuscript, as released by the University of Arizona. Well, at least as far as I believe it is the best possible current method of testing samples of parchment and vellum for age. But I am a skeptic at heart, and a pragmatist by nature, and to not automatically assume the infallibility of science, or of scientists or their methods of experiment. Not being able to test their methods myself, in many cases, I would have to rely on the hope that their methods are correct and accurate. Better yet, in some cases the scientists test themselves, and their own methods and conclusions… and we would hope that when they do, they can be, well, “scientific” about it. I mean, we must even trust them, in this self-regulation. In the case of the accuracy and value of the radiocarbon dating of vellum, there is at least one, seminal example. The paper is entitled, “Radiocarbon Dating of Parchment” (Nature, volume 235, January 21, 1972). 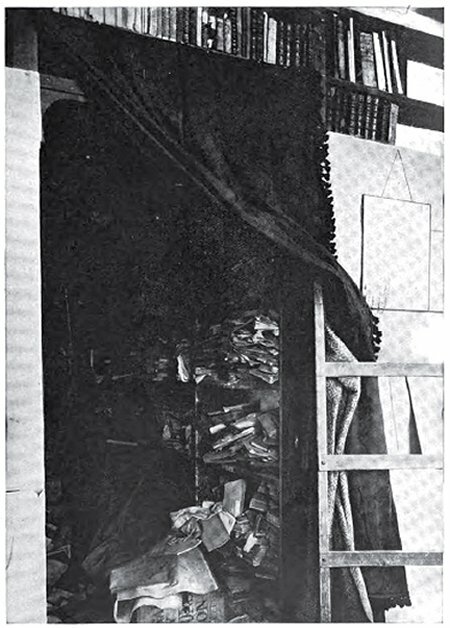 It is a 1972 paper outlining an experiment meant to apply the current radiocarbon testing methods to parchment and vellum, both to determine if it would be an accurate method of determining the age of manuscripts, and also, as a cross check to the dendrochronology of tree rings… itself used as a check of radiocarbon dating methods. I wanted to see the article to learn more about C14, as I was already pretty much in awe of the ability to date vellum, and wanted to learn more about it. But… I have to say I was somewhat shocked at what I found. 1820 ± 40, 1720 ± 30 or 1650 ± 15 for a 1788 document. Ok, so they had three wildly varying results… peaks I suppose, or whatever they call them, and chose the closest ones, and ignored the 1650 ± 15 result? Why? Because they knew it was from 1788, so 1650 ± 15 must have been wrong… and, by a minimum of 123 years! 1750 ± 20 or 1680 ± 15 for a 1752 document. Once again, they used the known date to come to a conclusion: One result was dead on, so they rejected the other… which was a minimum of 57, and a maximum of 72, years off. 1650 ± 15 for a 1666 document. Very good, they got one right. Well, they got one result, which it happens, was correct. If they had no check, though, they would not have known, of course. 1600 ± 30 or 1500 ± 25 for all three of these: 1495, 1579, 1578. OK now… this is interesting… they got two results, both the same, for three documents… of two very different eras. That alone is somehow disturbing to me. Why would a 1495 sample give the same results as a 1578 sample? That alone is almost 100 years in discrepancy. And then, they chose to feel it was accurate, but seemingly only by applying the 1600 ± 30 to the latter two documents, and 1500 ± 25 to the 1495 one. How do they know their results reflected the assigned ones? Because they knew the date written on them, that is how. But if they did not have the dates, they would, first of all, had a maximum age difference in the results of 155 years! That is, as old as 1475, to as new as 1630. The 1600 ± 30 result, if applied to the 1495 document, would be an error minumum of 75 years, and a maximum of 135 years. It is interesting that the radiocarbon dates after correction and calibration for secular variations correspond to thier known historical ages. But the nature of the calibration curve first developed by Suess sometimes permits age ranges or alternative dates rather than unique dates. Consequently, for samples of unknown age it may be necessary to use independent criteria to narrow the choice. That is bad enough, but there are other problems. In the same article it is stated that vellum “…was used for writing within very short periods of time from manufacture”. But how do they know this? For who is to say that in the case of the 1788 document, the vellum was not made in 1650, as one result showed, and that the 1820 ± 40 result was not the one in error? Maybe the vellum was over a hundred years old. I mean, since vellum had not been accurately dated before, then how do they know how long it sat? There is some serious circular logic happening here… first, they assume that vellum was used soon after manufacture, to validate their use of the known date of the sample, which they then compare to several wildly varying results, then pick the one which closely matches the date written on the document, and conclude the test is accurate! It is an assumption used to chose a result, and then that result is used to back up the assumption. 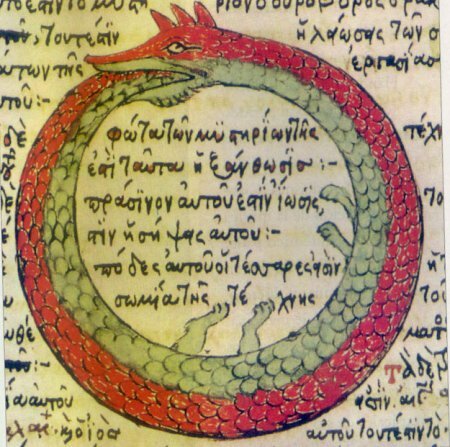 The ouroboros of scientific testing…. the snake eating it’s own tail… creating, the snake again. Well of course the testing in the case of the Voynich may still be very accurate. For the time being, we really have to assume that. Unfortunately for us, though, the official test results have never been released. We do not know if other results came up during the testing, but were discarded, as they were in the 1972 test. And if there were other results, we do not know why they were discarded. In the above test, we can see what criteria they used… they knew the dates, and threw out the results which did not match their expectations. But in the case of the Voynich, for “expectations”, they would have to use the opinion of scholars. That is, whichever Voynich scholar they relied upon, to make that judgment call.